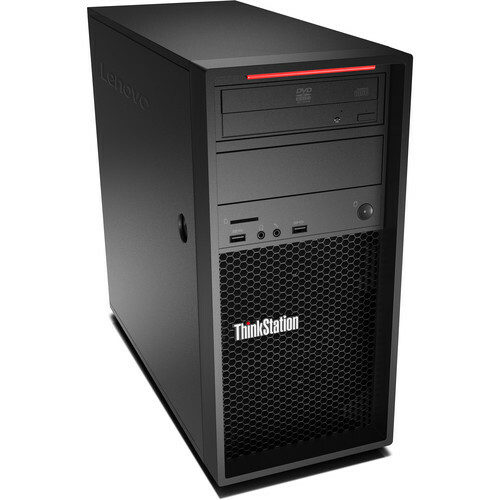 The ThinkStation P520c Tower Workstation from Lenovo is a powerful workstation designed for professionals in the creative field who need performance, storage, and processing capabilities. Specs-wise, it's equipped with a 4.0 GHz Intel Xeon W-2125 Quad-Core processor, 16GB of 2666 MHz DDR4 RAM, an NVIDIA Quadro P2000 graphics card, and a 512GB Opal PCIe M.2 SSD. To enhance this system's performance, you can install additional components including RAM modules, 2.5"/3.5"/M.2 storage drives, as well as PCIe-based expansion cards. Moreover, with Lenovo's optional Flex Module, you can add even more hardware and connectivity options as needed. Other integrated features include multiple USB ports, a SuperMulti DVD drive, 9-in-1 media card reader, Gigabit Ethernet LAN, and audio jacks. The operating system installed is Windows 10 Pro (64-bit). Box Dimensions (LxWxH) 21.0 x 19.5 x 11.5"